Since returning from Europe it has been our goal to try to eat a little lighter to counteract the multitude of fat calories and restaurant meals consumed during our trip. However, today is Bastille Day. I like to fancy myself a bit of a French history buff so I know that the French revolutionaries didn't storm the Bastille so that we could eat sprouted quinoa and whole grains. They did it so that Americans and Canadians living together in the future would be able to celebrate their shallow interpretation of French cuisine by eating whatever they wanted and writing about it on their poorly trafficked blogs. If you want to learn more about the history of the Bastille please read The Days of the French Revolution by Christopher Hibbert. I started by serving up some slices of pâté au poivre noir from Trois Petits Cochons. I also made a tarragon mustard with my mortar and pestle and some dijon mustard. This was to recapture the delicious Maille mustard I'd had in Zurich. It didn't quite match up to that one but it was pretty good. 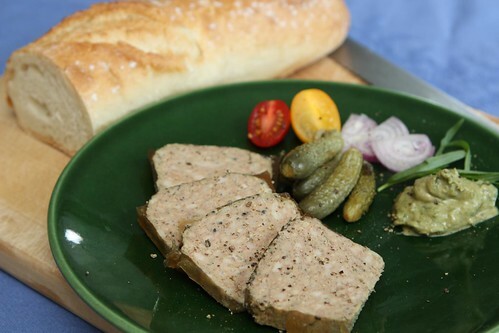 I served the pâté with cornichons, tomato and slices of shallot. Jen really wanted to start off with a French aperitif. Unfortunately we only have two French aperitifs, both of which are contenders for Jen's least favorite drink. First we have Aperitruffe, the truffle flavored liqueur. Secondly we have pastis which Jen also despises. After much consideration we chose to skip the aperitif this evening. 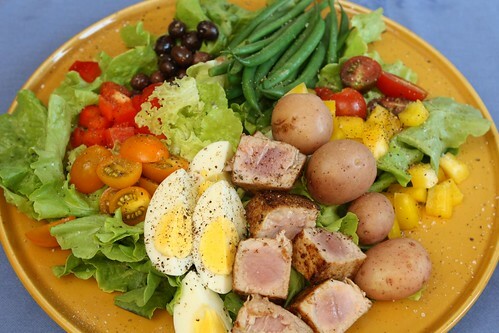 For the main course I made a giant Salade niçoise made with the Encino lettuce from the farm, red and yellow peppers, red and yellow tomatoes, boiled baby potatoes, steamed haricots vert, hard boiled egg, and pan seared tuna. On the side I made a dressing with tarragon, shallot, Dijon mustard, cider vinegar, garlic, olive oil, salt, and pepper. I opened a tin of anchovies as well to discover when I tried to remove them and they disintegrated at my touch. It was then that I discovered that they'd expired about a year ago. 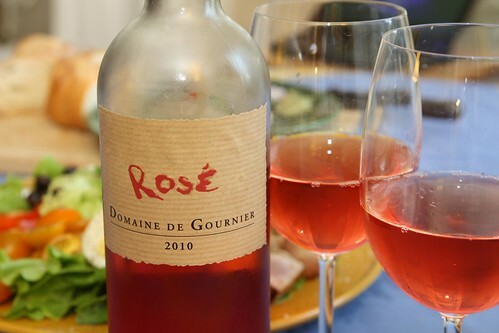 For wine we had this rose from Domaine de Gournier. French rose is Jen's favorite wine any time of year. On Bastille Day it seems even more appropriate. I would have loved to have a nice French beer with dinner but the only French beer that is ever easily accessible in the United States if Kronenbourg 1664. While I enjoy a nice 1664 from time to time it hardly seems in the spirit of the French Revolution. I don't think the "red" and "black" they were singing about in Les Miserables were referring to beer. 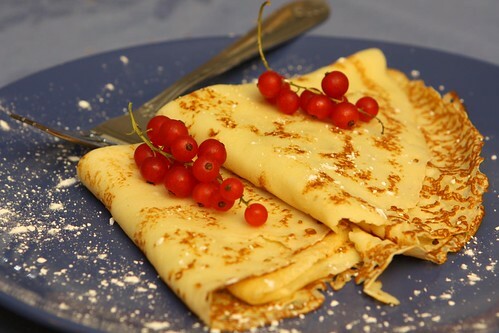 For dessert Jen made some crepes citron which are basically just crepes with lemon juice and powdered sugar. I garnished with the currants from the farm but they are a little difficult to eat being about four times as tart as lemon. Normally we'd watch the Tour de France to celebrate but the "all access" pass we purchased online was not really up for working this evening. However, I did entertain myself by continually attempting to reload the page and swearing at the computer. The site informed me that "This is a temporary issues that should be resolved soon." I bet this was exactly what it was like before the French revolted. No one should have to live like this. This Zucchini Bread is Redonk! Beaune Voyage! Hold the Dijon.